Tier 5-6 on mines north spawn. I'm driving a Stug, since I have decided to give the Grille line a shot. Game starts, I go to kemp bush like a good TD. One tank goes hill, a couple sit in spawn, another Stug pushes me out of the way because I must have taken his prime s'mores making spot. Anyway, I think, here we go - auto-loss. I decide I might as well help out the poor shlub who went hill all by his lonesome. I get there and nobody home. 5 reds went cap, and two TDs camped spawn over-watching hill (where no red went). In any event, a couple of our spawn camping noobs acted as bait for the Red town noobs, and the couple of players that know what they are doing on green clean up. Easy win. Overall, horrible game play though. Reminded me of the way tier 2 used to be. Edited by cheasesteak, 26 February 2019 - 10:27 PM. Just had a tier 8/9 match on Rockfield, called the team to go right towards the back of the map. Our T28 goes left and sits in a position where he cant hit anything if the reds also go to the back of the map. On the reds is a Toon of mediums from a very good and well known clan driven by a pair of 65% plus WR players. I have never met these players but do recognise their names. I call out to my team to watch for them and take them out quickly if possible. The match goes well its close but we are slightly up when I notice the red toon making a hard flanking manoeuvre to get behind us. They spot the T28 (who is still sitting in the same spot) and engage him, I turn to go back and help him. When I arrive I see the one of the toon sitting behind the T28 blocking him and the other side hugging the turretless TD. Fortunately I was driving a T30 and they wee both one shots for me and I was able do get rid of two dangerous players quickly and save the T28. The response from the T28 cracked me up. Generally u might get a "Tnx" or an affirmative in chat. Instead I got "F U Kill Stealer!" "They were my kills, F ing Kill Stealer"
and on he went for the rest of the match which we incidentally won. Afterwards he messaged me in chat "F U Kill Stealer"
I replied that their is no such thing as kill stealing and any way I saved your back side from two dangerous players that were taking you apart. His response "I had them right where I wanted them"
Anyway I look forward to seeing other peoples stories. Use it as a place to share the funny, the stupid or just rant. Edited by _Jake66_, 27 February 2019 - 05:43 AM. Well the stuff of legends happened to me, I thought it was only fables and rumors. Fighting tier VI, a green hits up chat telling me to shut up because "I was at the top of the list, I'm in charge." followed shortly thereafter with "I have a tier 9 too, u nubs." I feel as though I've been indoctrinated, in a way. IN CONCLUSION: WHAT THE ACTUAL HECC IS GOING ON HERE!?! Edited by MSGTGlitterGlue, 27 February 2019 - 09:07 PM. On my last IS-6 battle there was this red amx cdc spamming with stuff like “aluwackbar” and kill the “infidels”. I was driving along the side of the castle thing in Castilla when suddenly I block an HE shell. This cdc comes at me screaming “aluwackbar” in chat, I drop half of his hp with a single shot, he rams me and now he’s down to twenty hp, he drives off the side of the castle and dies. Then his toonmate replies “oh my allah, you killed akmed”! May I be the first to welcome you into the club. Just finished a game at Tier 4 that boggles. 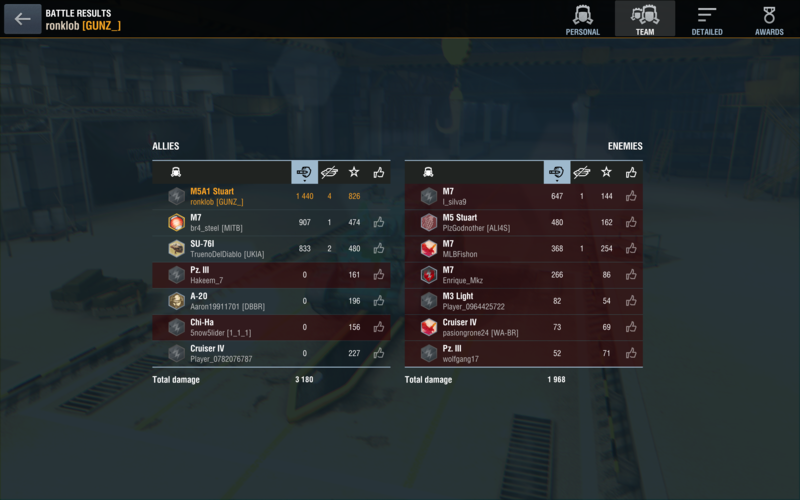 I was running a great game in my M5A1 against a bunch of reds that didn't seem to know what they were doing. I was concentrating so much on killing reds that I didn't even really keep track of my own team. I just knew that there was someone else there putting shots on target with me. Game finishes and I end up with a mastery (yay! ), but also see that three of us were playing and the other four were potatoes. I'll call this story "Unicum Tears Are the Saltiest Tears." The map is Yamato Harbor. I notice right away that I am playing against two of the very best players in North America from top clans who are tooning together. I figure that this will probably be another loss (today was ROUGH for me - I'm not good enough to carry these teams I keep getting!). Guess what? The VK kills me in the hills, but I see our team is capping the base, so of course I have to comment on this (two pics)! And then I get salty. I can, you know - and like I said, I was sick of having my [edited] handed to me all day (three pics). And as you can see, I can be one mean son-of-a-[edited] sometimes. Oh well. All in a day's tanking. Edited by TonnerreCadien, 12 March 2019 - 02:29 AM. Just had a match where we lost a close encounter. As our last tank fell one of the reds types “yes” then “bye bye”. I look at the post match and this guy has done 300 damage. Edited by WipWapJaws, 13 March 2019 - 04:33 AM. That's nice. But not nearly mean. I had a post-match PM where he had to bring moms into the conversation. As soon as I returned the favor he hit me back with the classic "my mom is dead you a-hole" routine. I said that explained the foul taste and odor. got my first ban. Ha! My typical response..."explains why she just laid there"
I knew we were cut from the same cloth! Got raged at for being a stupid scrub useless 40%er. Guy was clearly a reroll 52%. I'm at 49.57%. My apologies, oh king of the game people play while they sh!t. Edited by John_Haefke, 09 April 2019 - 04:10 PM. you noob your so bad, kill you SelF omg come ON yoU frIkIn lOseR! ...if I had a nickel.